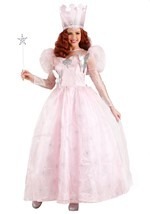 This Adult Kansas Girl Dress Costume is perfect for those who want to get her classic look. The dress has a blue and white checkered pattern throughout along with an attached white blouse and can be tied around the back of the waist. The dress has a snap closure in the back. Small, light blue trimming decorates the collar and ends of the sleeves.